Love at First Glance begins with a story about depressed chipmunks, and frankly, I’m going to recommend you do a deep dive into that instead of watching this movie. 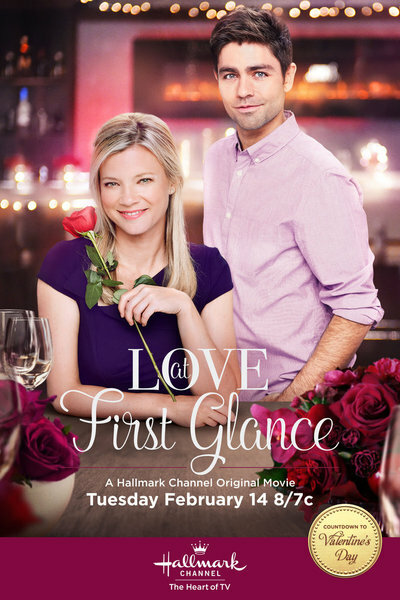 It’s not the worst thing I’ve seen on Hallmark, but it’s damn lazy storytelling and a complete waste of two talented leads. The generic premise doesn’t live up to even my low standards, and if it wasn’t for Amy Smart powering her way through this, I’d have turned it off before the second commercial break. The general idea is that two strangers catch each other’s eye on the train, and when one forgets his mobile, the other searches high and low to reunite the phone, and possibly herself, with him. Many a romance has worked hard to keep its lovers apart in attempt to prove that distance makes the heart grow fonder, but Love at First Glance barely gets past that first glance. Still, it asks you to believe that its two main characters are a heavenly match. That’s hard when James Fielding (Adrian Grenier), the one who left his phone, is a cipher. In fact, “phone guy” is about all I’ve got when it comes to his defining characteristics. We don’t know anything about him from his own actions since he jets off to Paris immediately after crossing paths with journalist Mary Landers (Smart). Their first and one of only several exchanges happens via text, when he asks her to hang on to his phone until he returns on Valentine’s Day. He gives her permission to write a profile on him for the newspaper as well, so I guess he’s also the kind of guy who’s doesn’t mind surrendering his private information to strangers. The fun, if you can call it that, in the story is discovering who this James character is alongside Mary as she interviews everyone on his contact list. The guy with Chris Pine looks slowly comes into being as she revisits important moments in his life and in the lives of the people he impacted. It’s one way to tell a story but not the best way to know a character. We see him through other people’s eyes, and they don’t make the most reliable narrators in this case. Friends, associates, and exes all share the best side of him. He’s a photojournalist who appreciates the tango, he has a soft spot for service animals, and he still thinks about his childhood sweetheart. The movie paints a too perfect picture of the guy for its audience and for his intended partner. While it’s hard to imagine James as a real person, Mary is much closer to life. Smart does most of the heavy lifting, taking on the weight of the film’s only three-dimensional character and doing a damn fine job of it. In some ways the film is more about her journey from a disappointed reporter stuck in a relationship with a Mickey Rooney lookalike to confident woman who finds satisfaction in her personal and professional lives. The strained attempt at romance is a distraction from her own self-discovery. The writers try to push the non-existent relationship to the fore but Mary’s ebullience overshadows anything having to do with James. Grenier is dreamy, especially sans some of that Entourage baggage, but ultimately he has little to do. James is a passive character, there to be shaped by others instead of having his own agency. The actor plays fantasy boyfriend well, but James is just dull. Smart has the better part by far, and I wouldn’t mind spending time with her despite her occasional flair for the dramatic and her annoying co-conspirator roommate (Jonathan Bennett). Mary has a breezy air about her but shows herself to be compassionate and strong-willed. Smart’s performance though exposes the rest of the movie’s shortcomings. Posted in USA, Western TV reviews and tagged Hallmark Channel, romance, TV movie on October 16, 2018 by limmer13.